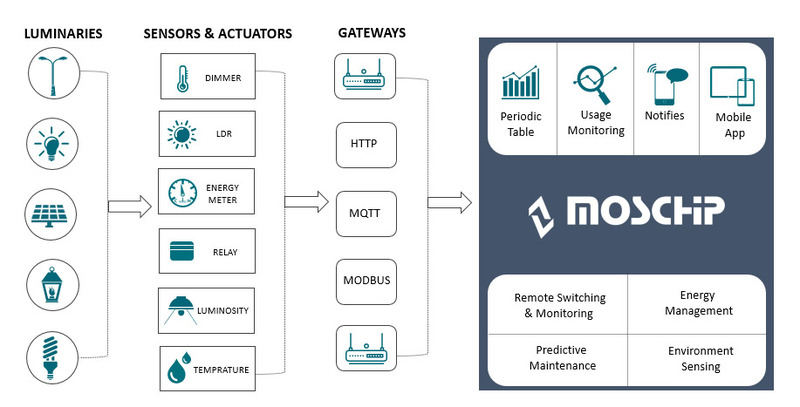 MosChip’s Smart Lighting Solution is ready to deploy a solution which enables you to control indoor & outdoor lighting system from a single dashboard. Our smart lighting solution can be used as highways, streets, sports arenas, buildings, industries and even at home enable the user to manage and control the lighting system from anywhere. With our solution you can do remote switching, monitoring and control provided financial benefits regarding energy savings and proven ROI, whether you are retrofitting our solution to existing luminary fixtures or integrating it with any futuristic lighting technologies. Smart lighting entails numerous forms; they are not limited to residential projects. MosChip’s Smart Lighting Solution delivers cost effective and efficient lighting. With MosChip’s Smart Lighting Solution you can remotely switch on/off the lights from a single dashboard. The lights can also be scheduled for on/off time using the scheduler in the platform. Our Smart Lighting Solution has remote monitoring capabilities which enables remote data collection and delivers actionable data to business/governments. Customers can now get access to lighting parameters like power, load, faults, fluctuations, thefts etc using a single dashboard from anywhere. Our Smart Lighting Solution triggers alerts via SMS/Email in case of any abnormalities. Our system identifies faults and segregates as a minor or a major issue. The faults are categorized based on colours. In case of any theft and uncertainty, an alert is sent to the registered email or mobile number. With our solution get hourly/daily/weekly/monthly report on Phase wise electricity consumption, ON / OFF audit reports and fault and error notification on a single dashboard. Users can download reports in excel to further use he reports for business. With our solution manage the lights from multiple location using a single dashboard. Also, access the feeder level status and performance indications of lights across various locations of a map. This helps in the on-time maintenance of the luminaries and increase the life span of the luminaries. With secured role-based option, keep a track on who has access to the dashboard. Platform also provides special emergency on-off facility with wireless control.